There isn't one way to fertilize all Florida fruit trees. Florida has temperate, subtropical and tropical climates, and fruit trees that grow in each. For example, an apple tree in Northern Florida is not fertilized the same as a low-chill apple tree in South Florida. The methods of fertilizing fruit trees in Florida are as varied as the trees themselves. Learn about your fruit trees. Contact your local extension service and ask for any publications it may have on your particular type of fruit trees. The University of Florida Extension Service website has information on every fruit you can grow in Florida and the care requirements for each. Learn about your soil. Florida has several different soil types. Learn whether you need to alkalinize or acidify your soil for your particular fruit tree. This will determine which kind of fertilizer you should use. For example, pomegranates need acid soil, while citrus do well in alkaline soil. Buy the proper fertilizer for your fruit tree. 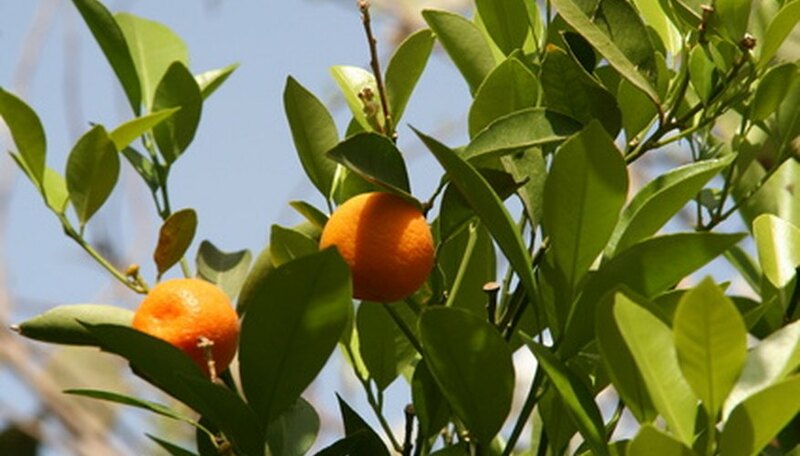 Orange trees need a different combination of essential and minor elements than apples. An all-purpose fertilizer will not provide everything your Florida fruit trees need to grow well and bear fruit. Buy a fertilizer that contains the proper formulation of major and minor elements for your particular fruit. Fertilize on the proper schedule in the proper amounts. Young trees need to be fertilized differently than established trees. Giving a tree too much or too little fertilizer, or fertilizing at the wrong times, can yield disappointing results and may cause bloom or fruit drop. Spread fertilizer evenly from 12 inches away from the trunk to the drip line (the outermost edges of the limbs). If you have pruned the tree, spread it to where the old drip line was, as the roots still reach out to that point. Don't pile up fertilizer around the trunk of the tree. Visit a locally owned garden center with employees who know fruit trees and how to grow them. They can give you local growing tips and recommend fertilizers that work best in your area. While compost and manure can help your fruit tree, they may not provide adequate nutrition for fruit development. Learn what organic products contain the elements needed for your tree. If you miss a scheduled feeding, do not double up on the next feeding. Contact an expert to find out what to do.